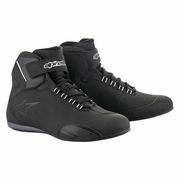 Alpinestars Sektor WP Shoes use durable lightweight microfiber to protect against abrasion without adding extra weight. A waterproof membrane helps to keep your feet dry and comfortable during rainy rides. Alpinestars' speed lacing system and ankle straps make slipping into the Sektor boots quick and easy without undermining security. External TPR material at the toe helps to reinforce against abrasion. For the price these riding shoes are awesome. Well constructed, feet feel protected, and they are the most subtly stylish shoe I found. Perfect connection with my bike. I was toss up between the vented and waterproof and I’m glad I went with these after getting caught in a little rain and even in cooler weather. No complaints. I was kinda let down by the comfort. it was hard to get my foot in an out an they are stiff an don’t flex much at all but I guess that’s part of what helps protect you. I wouldn’t want to have to walk around in them for an extended amount of time but work great as long as I’m riding, just bring extra shoes with you. The shoe looks great. An because it’s water proof it’s also very warm. Fit Perfectly, looks and feels great. The fact that this feels better to walk in than my jordans or NMD shoes, is amazing on its own. they have great comfortability but i imagine because its waterproof they will get pretty warm in the summer. even now in this 80 degree weather my feet dont feel too hot. so you should be fine. I have a bit of extra space in the toe box as well, as mine are a bit wide. it still has plenty of space to wiggle my toes a little. great buy. will have to leave another review a couple of months from now to see how they fair.